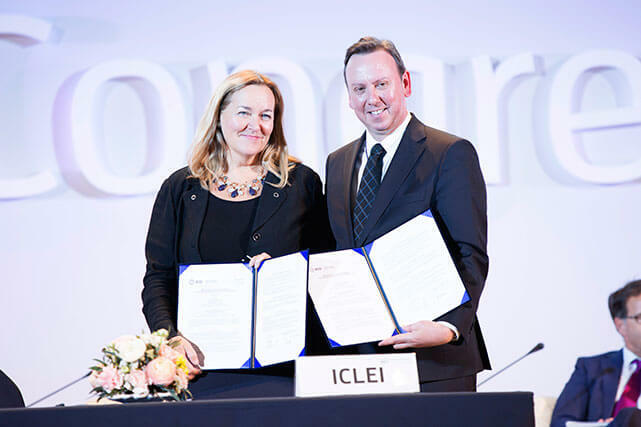 Patricia McCarney, director of the Global Cities Institute at the University of Toronto, with ICLEI Secretary General Gino Van Begin at the ICLEI World Congress in April. 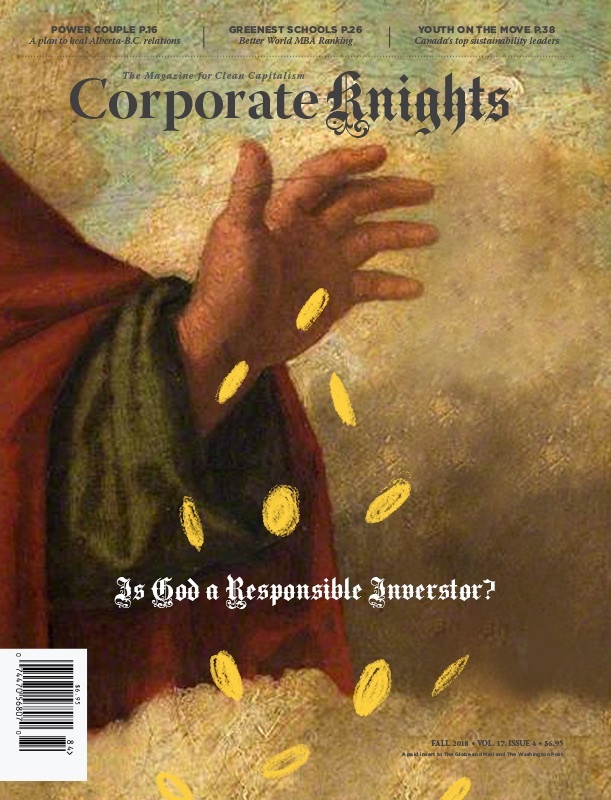 Corporate Knights has ranked cities based on their sustainability performance for several years, but each time it has been a challenge finding data that is even roughly comparable. It’s not just a problem when examining cities located in different countries. Even within Canada, cities often report data in different ways. The most basic indicators, such as air quality and public transit use, are tracked by Environment Canada and Statistics Canada and easily accessible. But try finding out about cycling and green building infrastructure, or even something as simple as energy use per capita, and city data is a mixed bag of apples and oranges – with strawberries, pears and bananas thrown in to make life more difficult. It’s not that we lack data. Smart city expert Michael Jansen says the rising use of sensors, web portals, mobile devices and machine-to-machine interaction has led to an explosion of city data. “As a benchmark, cities now generate 4.1 terabytes of data per square kilometer of urbanized land area, and will increase output by 40 per cent per year through 2020,” Jansen wrote in a recent commentary. He lamented, however, the lack of common standards for consolidating, visualizing, analyzing and sharing city data, calling it a “fundamental void” in the industry. The Global Cities Indicators Facility (GCIF), a program of the Global Cities Institute at the University of Toronto, has spent the past seven years trying to fill this frustrating void. The reason is simple: by 2050 about 67 per cent of the world’s population, or about 6.3 billion people, will live in cities. Sustainably accommodating these people over the coming decades means better understanding how cities of different sizes and geographies operate and thrive. It also means having a reliable way of comparing their performance – apples to apples – so that best practices can be identified and shared. Simply put, “Comparative data allow cities to exchange knowledge,” said institute director Patricia McCarney, speaking at the ICLEI World Congress 2015 in April. The GCIF has worked with 255 cities from 81 countries trying to find common ground on data collection, and its efforts are paying off. Where there was once a void there is now an ISO Standard and a global movement to embrace it. Three years ago, the Global Cities Institute began working with the International Organization for Standardization (ISO) on a data standard for cities, one directly informed by GCIF’s work. The result of that work was formalized last May with the publishing of the ISO 37120 city data standard, and the launch of the World Council on City Data (WCCD) – a GCIF spinoff based in Toronto. At launch, the first 20 council participants were announced, among them Amsterdam, Barcelona, Boston, London, Shanghai and Toronto. All 20 have since been verified and certified to be in compliance with ISO 37120, allowing them to be included in the newly created Global Cities Registry. The next milestone, says Lynch, is to build up to 100 cities. WCCD isn’t the only organization pushing for city-level standards. Last December, at the COP20 climate conference in Lima, Peru, the World Resources Institute – in partnership with C40 Cities and the ICLEI – announced the Global Protocol for Community-Scale Greenhouse Gas Emissions Inventories, which has become the specified methodology within ISO 37120 for measuring city-level GHG emissions. The timing is prescient. Last September, at the UN climate summit in New York City, former mayor Michael Bloomberg and UN Secretary General Ban Ki-moon launched the Compact of Mayors to mobilize city efforts on climate action in the lead-up to COP21 in Paris. With cities increasingly recognized as major players in the climate fight, the need to track and report their performance has never been more important. But ISO 37120 is more about climate adaptation than mitigation, and as Lynch points out, the standard continues to evolve with the objective of helping cities become more resilient. In March, the WCCD partnered with the UN Office for Disaster Risk Reduction (UNISDR) with that goal in mind. The two organizations will work together to incorporate UNISDR’s “Ten Essentials for Making Cities Resilient” into ISO 37120. Armed with reliable and comparable city information, the hope is that cities can better prepare themselves for natural disasters, as well as the floods, droughts, heat waves and other extreme weather events expected to become more common and intense as our global climate changes.